Let me backtrack a little. As I was busy working on the connectivity project, it wasn’t as though the Wind Waker 2 project that I spoke of earlier came to a halt. Not at all. As some of you know, at E3 2004, we unveiled the game that would become Twilight Princess, the realistic Zelda game, and we announced that it was developed by the team that had been developing Wind Waker 2. Actually, there was a reason that that decision was made at the time. At one point, I had heard that even Wind Waker, which had reached the million mark in sales, had become sluggish in North America, where the market was much healthier than in Japan. I asked NOA why this was. What I was told was that the toon-shading technique was, in fact, giving the impression that this Zelda was for a younger audience and that, for this reason, it alienated the upper teen audience that had represented the typical Zelda player. 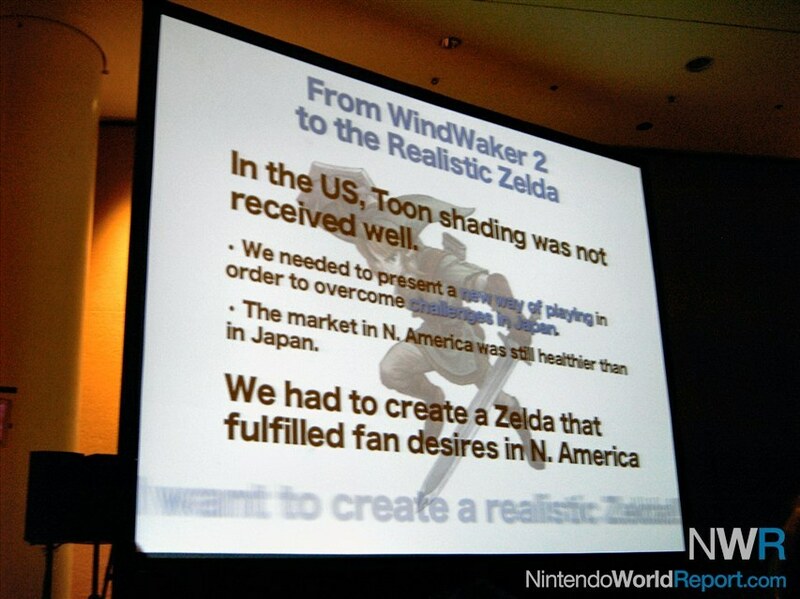 Having heard that, I began to worry about whether Wind Waker 2, which used a similar presentation, was something that would actually sell. In addition, because we knew how difficult it would be to create an innovative way of playing using existing GameCube hardware, we knew what a challenge it would be to develop something that would do well in the Japanese market, where gamer drift was happening. That’s when I decided that if we didn’t have an effective and immediate solution, the only thing we could do was to give the healthy North American market the Zelda that they wanted. So, at the end of 2003, I went to Miyamoto and said, “I want to make a realistic Zelda." Miyamoto was skeptical at first. I was so focused on changing the look of the game as being the solution we were looking for without coming up with a breakthrough game idea, and he advised me that “If you really want to make a realistic Zelda, you should start by doing what you couldn’t in the Ocarina of Time. Make it so that Link can attack enemies while riding on his horse using the Wind Waker engine, and make your decision based on how that feels." This is something that went against everything that the staff had been working on and I expected to come as quite a shock to the team. Surprisingly, my entire staff was enthusiastic about this change, and the project on which progress had slowed was given a much-needed jumpstart. Four months later, development had progressed to a point where Link could swing his sword in battle against enemies while riding on his horse in a realistic looking environment. 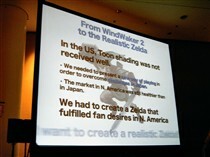 When it was announced as a surprise trailer at the 2004 E3, it received a standing ovation by the media audience. This was a very exciting moment for us, but we were still very much in the early stages of converting the game into something more realistic. We knew that we had to create a Zelda game that would live up to expectations of fans in North America, and that if we didn’t, it could mean the end of the franchise. But I also trusted the ability of the team, which was able to bring the game so far in just four short months, and Miyamoto and I announced that this Zelda would be released in the fall of 2005.